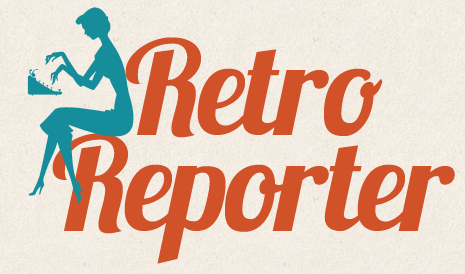 As you may recall, I got Vintage Fashion: Collecting and Wearing Designer Classics by Emma Baxter-Wright for Christmas this year, but it's not until now that I've finally had time to review it. This coffee-table style reference book is great for any fashion lover to have on hand to flip through and reference, no matter if you are a vintage devotee or merely curious about the aesthetics of decades gone by. The book is broken down by decades per chapter (except the 1900s to '20s are lumped in one) which are written by separate authors per chapter. 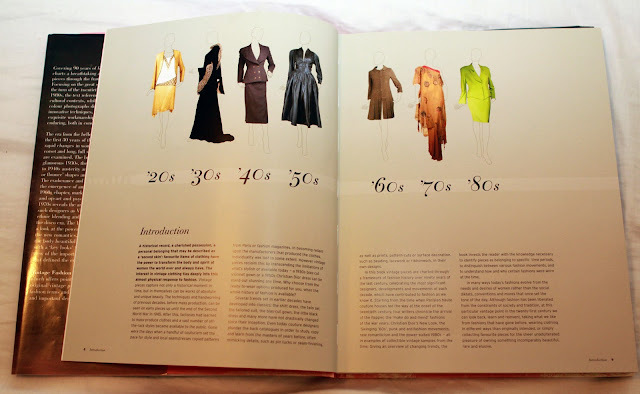 Each chapter ends with a pictograph outlining key looks of the era - a quick reference guide for style, fabric, shapes and trends. In terms of writing, I did find the book a little disjointed as every chapter has a different author. Some chapters, therefore, are not as detailed or organized the same as others. There were, however, so many beautiful colour (and black and white) photographs of period clothing as well as photos illustrating whole trends and outfits. 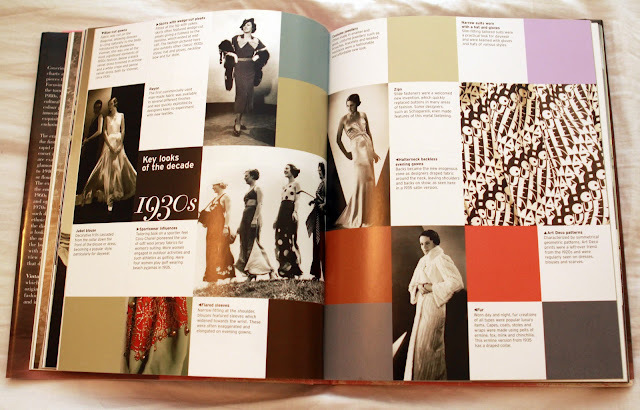 Personally, the 1920s section was fascinating because the styles and trends shifted so rapidly that almost every year had its own distinct style. I also know very little about the 1930s fashion (I grew up in a farming family, so 30s automatically equals the Great Depression in my mind) so I have a hard time visually identifying styles with the 30s, whereas I find the 20s, 40s, 50s and 60s much easier. I find it interesting that the 70s and 80s were included in the book. Many of us vintage gals typically think of the term 'vintage' stopping after the 60s, but I really enjoyed the 70s and 80s sections because it shows how these decades echoed the trends of 30s - 50s, which therefore can make it easier for buyers to determine if something is genuine or a 70s does 30s piece instead. As well, the back of the book includes a shopping guide with buying and garment dating tips and also includes guides on care, cleaning and storage. There is also a glossary of top designers and fashion terms. 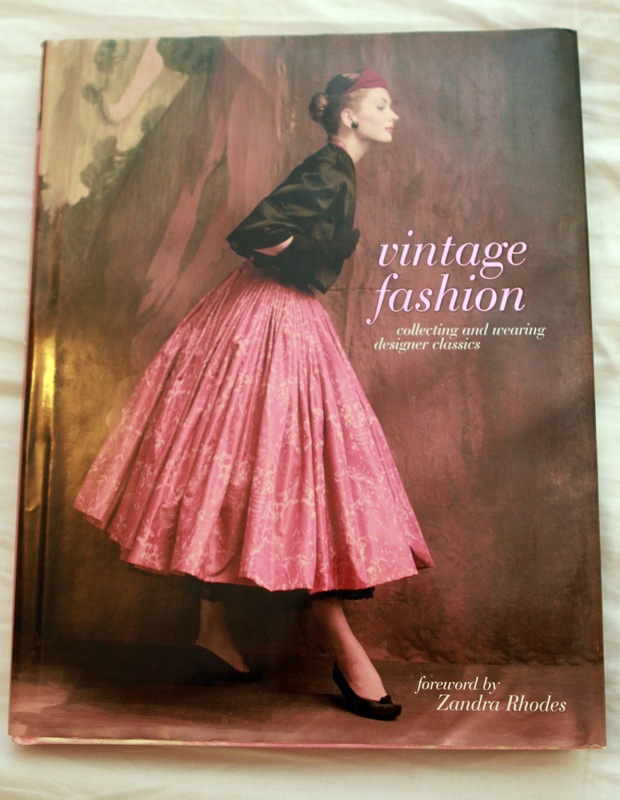 In all, I give this book 4/5 stars and think it would be a fantastic bookshelf addition for any vintage style lover, especially those looking for something that is easy to read, has quick references and is easy on the eyes. Have you read Vintage Fashion: Collecting and Wearing Designer Classics by Emma Baxter-Wright? What did you think of it?